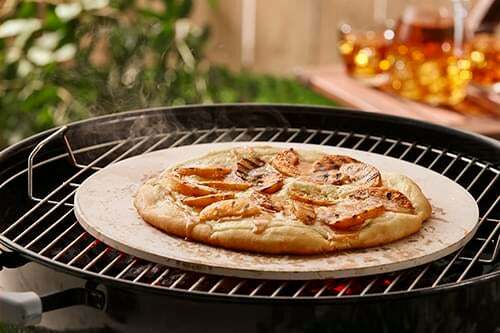 Build a charcoal fire for direct grilling using Kingsford® charcoal and place a pizza stone on the grill to preheat. In a small saucepan, heat half the milk until just simmering. Do not let the milk boil. In a separate bowl, whisk the egg together with the rest of the milk. Pour the warmed milk into the egg mixture and stir until well blended. Pour the mixture back into the saucepan. In another bowl, stir the sugar, flour and salt together. Fold the sugar mixture into the milk and cook, stirring, over medium heat for 20 to 25 minutes or until the mixture thickens. Stir in the butter and vanilla and let stand for 10 minutes. Grill the peach slices over direct heat for 2 to 3 minutes or until grill marks appear. On a well-floured surface, divide the dough in two. Roll half the dough into a 12-inch circle. Dust a pizza peel with cornmeal. Place the rolled pizza dough on the pizza peel. Spoon half of the sauce evenly over the pizza and top with half of the peach slices. Slide the pizza on to the stone. Cook the pizza covered for 10 to 12 minutes or until the crust has browned and looks crispy. Drizzle the pizza with the caramel sauce. Sprinkle the pizza with half the salt. Repeat with the remaining ingredients.